Whenever you use an address label that's self-adhesive, there's a good chance Avery Dennison made it. Avery's parent company, Avery Dennison, was founded in 1935 and has become a global leader in technology and self-adhesive solutions for consumer products. Best known for its Avery brand office and consumer products, the Avery brand manufactures a variety of products for home, school and office. ReStockIt.com offers thousands of Avery products for any organizational need. From popular 8160 labels, to dividers, cards, binders, clear address labels, name badges, writing instruments, inkjet round labels, tags & fasteners, crafts & scrapbooking supplies and more, Avery brand products offer self adhesive solutions to common, every day needs. 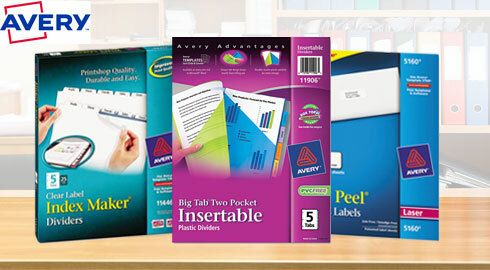 ReStockIt.com even offers Avery products in such categories as: store supplies and signs, binders and file folders and accessories and mailroom and shipping supplies. Whether you are producing a mass mailer, product labels or just need to print one, clear address label, Avery labels are your best bet! ReStockIt.com has a huge selection of round labels for inkjet and laser printers as well as, 8160 labels for mailing letters and envelopes and a broad choice of clear address labels for labeling everything quickly and easily. ReStockIt.com offers the lowest price guaranteed every day- this means no more online hunting for the best prices on Avery address labels and Avery office supplies you need. And, with fast, safe and often free shipping, ReStockIt.com will ship your Avery office supplies quickly. Get the best prices on Avery address labels and start labeling today! 2. Avery White Name Badge Labels, 2 1/3"x3 3/8"
Avery Laser Address Labels with Smooth Feed Sheets, 1"x2 5/8"